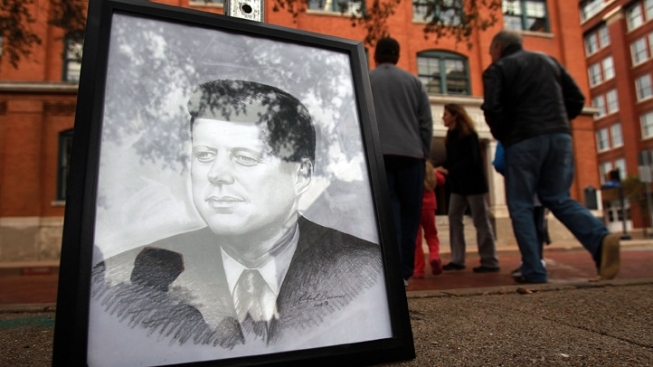 A pencil drawing of John F. Kennedy sits in Dealey Plaza during the 48th anniversary of his assassination on Nov. 22, 2011 in Dallas, Texas. The City of Dallas says nearly 14,000 requests for tickets were received by people who hoped to attend an observance in Dealey Plaza on the 50th anniversary of the assassination of President John F. Kennedy. The city has said only 5,000 tickets will be available for the event and that only half of those will be offered up to North Texans. The other half will go to government and city leaders, the media and the public who live outside of DFW. The city said 13,700 people filed requests for tickets by the July 31 deadline. Next, a computer will randomly allocate the 2,500 tickets available, though those who receive tickets are subject to a security screening by the Dallas Police Department. The tickets, once granted, will be available for pickup on the day of the event and are not transferable. Remote sites will be set up nearby Dealey Plaza so those who are unable to attend the event can see the ceremony on Nov. 22. More information about the Kennedy Memorial Ceremony is at 50thHonoringJohnFKennedy.com.